So, I am looking to thin my commentaries a bit. 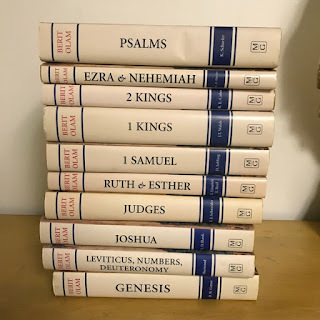 Over the years, I have attained a number of different texts and commentaries, sometimes getting duplicate copies of ones I already have. One example is shown below, which consists of 10 volumes of the excellent Berit Olam commentary series from Michael Glazier/Liturgical Press. The Berit Olam series is "written for lay people, Bible scholars, students, and religious leaders, this multi-volume commentary reflects a relatively new development in biblical studies. The readings of the books of the Hebrew Bible offered here all focus on the final form of the texts, approaching them as literary works, recognizing that the craft of poetry and storytelling that the ancient Hebrew world provided can be found in them and that their truth can be better appreciated with a fuller understanding of that art. The authors reflect a variety of religious traditions, professional backgrounds, and theoretical approaches. Yet they share a common desire: to make available to all of God’s people the words of the everlasting covenant in all of their beauty. I am looking to sell these to someone (in the USA) who would make a good home for them and actually use them. These 10 volumes are not easy to get on the cheap, however I am happy to accept any reasonable offer. I am not looking to get rich in selling them, so feel free to make any offer you seem to think is fair. If interested, send along an email to me at mccorm45(at)yahoo(dot)com. Please do not make any offers in the comments. I would like to sell them all as a set.